This is a list of extinct indigenous peoples of Russia. The list doesn't include Ancient or classical historical tribes in the period of 4000 BC to 500 AD. List does include tribes of Russia from 500 AD to 1519 AD the Middle Ages. List also includes Endangered groups for comparison that for all intents and purposes will become extinct such as facing Extinction vortex 500 members or less by 2002 Census so we will have to check back in here in a future census to see how they are faring in the census. A general map of Russian territory before the beginning of the Slavic colonization. 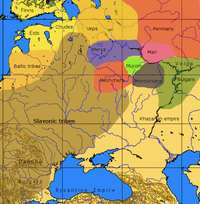 Slavic migration began in the 6th century and some of indigenous peoples who lived in European Russia and Siberia assimilated by the Russians. Chud: extinct after the 12th century. Kamasins extinction reported in 1989. According to the 2010 Census, population of 2. Almost all of the Kamasins had assimilated with the Russian peasantry by the early 20th century. Khodynt Yukaghir extinct due to a plague in the late 17th century. Mators: extinction in 1840s, assimilated by the Russians and Siberian Turkics. Volga Bulgarians became extinct some time after a Mongol attack in 1430. In modern ethnic nationalism, there is some "rivalry for the Bulgar legacy" (see Bulgarism). The Volga Tatars, Chuvash, and Bulgarians are said to be descended from the Bulgars, as well as (possibly) the Balkars. Muromians assimilated by the Russians 12th century. Merya assimilated by the Russians around 1000 AD. Yurats Samoyed assimilated into Siberian Nenets people in early 19th century. Sirenik language extinction in 1997. This ethnic group, the Sirenik Eskimos, is no longer enumerated in the census and members and, if surviving, might have changed their identity into another related and larger ethnic group such as Yupik or something completely different. ^ a b Viktor Aleksandrovich Shnirelʹman, Who gets the past? : competition for ancestors among non-Russian intellectuals in Russia, Woodrow Wilson Center Press, 1996, ISBN 0-8018-5221-8, ISBN 978-0-8018-5221-3. Cf. chapters: The Rivalry for the Bulgar Legacy, The Neo-Bulgarists, etc. This page was last edited on 29 September 2017, at 12:07 (UTC).